Back in October, I received an e-mail from our good friend Jimmy Corley, the executive director of the Arkansas State Board of Public Accountancy, asking a frequently heard question: “How does NASBA, made up of multiple jurisdictions, come to a position on any particular issue of interest to the accounting profession?” I have heard similar questions over the many years that I have been associated with NASBA, both as a NASBA employee and as executive director of the Missouri State Board of Accountancy. As the newly selected President and CEO about to take the reins, Jimmy’s question was particularly meaningful to me. In my early talks with Mark Harris, who was beginning his term as Chair of NASBA, we discussed the question and found we both felt a clear answer was necessary. The need for developing a process for agreeing upon a “NASBA position” has increased in significance as the organization has continued to grow in national and international relevance. State Boards of Accountancy, in part because of their being 55 disparate and unique political entities, have historically struggled to have any material input or impact on crafting federal legislation, regulation promulgation, and rule and standards writing, although the Boards are responsible for the application and enforcement of those rulings in their states. Similarly, in the global economy, states are impacted by international accounting related changes, such as the proposed convergence with International Financial Reporting Standards, but are not given a direct role in the decision-making processes. 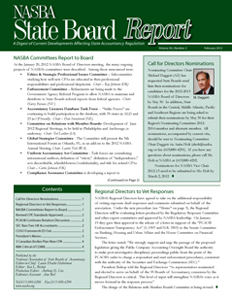 NASBA, as the Boards’ representative organization, is well placed to monitor, evaluate and respond to these issues, with the caveat that NASBA will sometimes opine differently from the position of some individual State Boards and/or Board members. The challenge has been to come up with a process that works and is accepted as a well-reasoned and open discussion that reflects the regulator’s responsibility to protect the public. NASBA’s increased relevance as an association has taken years to develop. Our volunteers and staff have forged close working relationships and contacts with national agencies including the SEC, PCAOB, IRS, FASB, FAF, international organizations such as IAASB, IFAC and many others. These relationships have been enhanced by NASBA’s participation in conferences, forums, roundtables, commissions and consultative advisory groups. As a result, NASBA has increasingly been asked to participate in deliberative processes and to provide opinions and responses. Failure to respond would weaken, or discredit, the relevance we have all worked so hard to achieve. At the January meeting of the NASBA Regional Directors, a process was approved that will create a vetting and approval method for considering, developing and communicating the “NASBA position.” Important and material issues, such as the recent Blue Ribbon Panel’s report, will be openly discussed and vetted at NASBA Regional Meetings and other public forums to allow input from as many stakeholders as possible. In the occasional events where there are tight time parameters, an accelerated process will involve staff, NASBA leadership and relevant volunteer committee(s) to develop responses and opinions. The proposed NASBA response, coming from either the long or short pathway, will be given to the NASBA Regional Directors for approval. The NASBA Regional Directors, elected to represent State Boards in each geographic region of the country, will provide a direct nexus to all State Boards of Accountancy. As with anything new, the “NASBA position” vetting process will evolve and improve. But, most importantly, it falls within our “back to our roots” initiative, to consider our mission to “enhance the effectiveness of State Boards of Accountancy” in all we do!